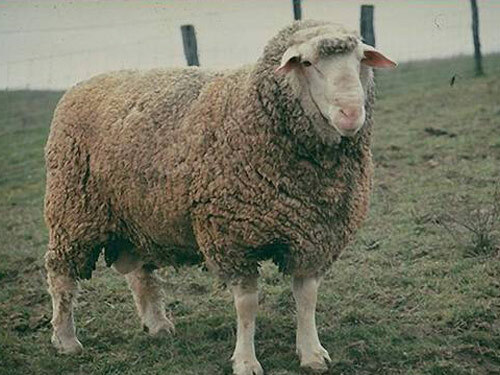 At the end of the 18th century, Merino blood was introducedrninto German sheep in the borders with France, and gradually these large meat Merinos were kept in large numbers in the Alsace Lorraine region of France.rnThis breed became known as the Est a Laine, which translated means East andrnWool. Est a Laine Merinos are an attractive, strong, large-framedrnsheep with very fine white wool. Their head is long, white in color, with long,rndrooping ears. Their sheep is naturally polled (no horns), unlike the originalrnMerinos. Their necks have no folds or dewlap, making them easier to shear.